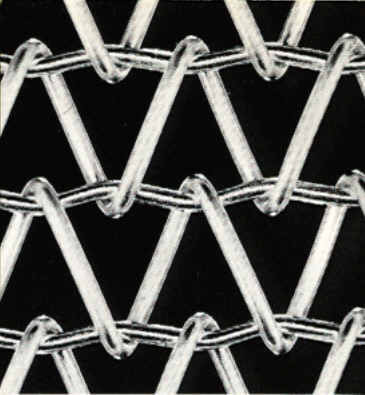 Audubon Balance Weave is our most economical mesh styles available and most versatile for many applications. 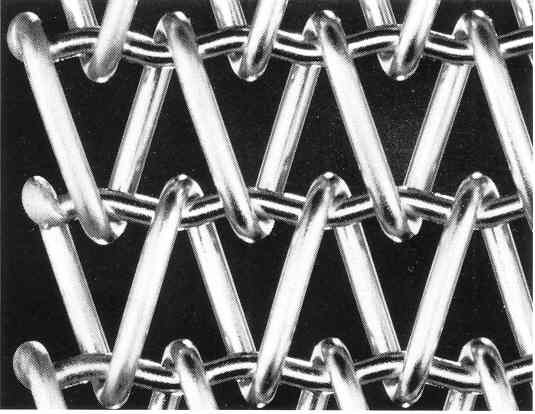 Conveyor Belt Applications: Balance weave is an economical, general use belt for medium load applications from 40 - 1500 degrees F. It is the most commonly used wire mesh conveyor belt worldwide including many food processing applications (from draining to cooling) as well as industries ranging from ceramic, glass and metalworking. For medium temperature and load conditions, these belts are very economical and will fit well into any company's budgets. Where a job demands small pulleys, this is the style for you. Audubon's Balance weave is an excellent choice for a transfer conveyor belt. The balance weave belt is used more widely on more applications than any other woven wire mesh conveyor belt. Glass is annealed on it, potatoes drain on it, product cools on it, vegetables are washed on it, pretzels are salted on it. The uses of a balance weave conveyor belt in a conveying application are endless. It's also commonly used in other applications as screen, or guards or mesh panels. 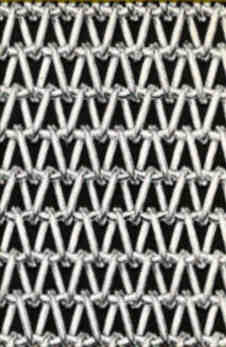 Balance weave mesh offers a variety of choices. The mesh can be very open, or very tight (see the series buttons below to see the variations. 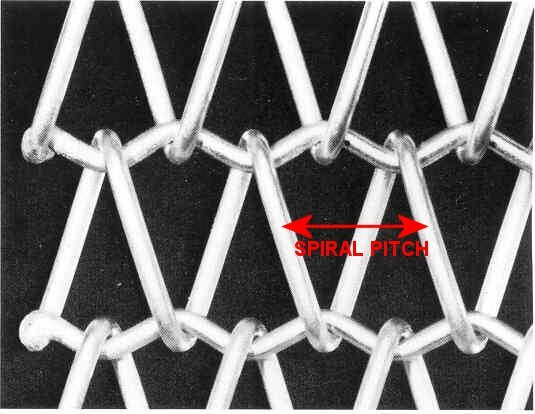 The higher the first count of the specification, the tighter the mesh, as that number stands for the number of spirals in 12" of mesh width. Although minimum pulley diameters must be taken into account when choosing a mesh. Balance Weave wire mesh conveyor belts install easily with simple maintenance. Damaged sections of the belt are easily replaced by the end user, which allows for less downtime. A Balance weave's construction is an alternating right and left hand spirals that do not interconnect with each other. They are joined by a crimped rod which holds each spiral in place. The rods connecting the spirals are can be of a larger diameter than the spiral wires, adding durability to the construction. The spiral seats on the crimped connecting rod, allowing the belt to run straight and true. The belt will not creep to either side. All Audubon belts are tagged with installation instructions. Splice rods are sent with belt ordered. A Precision Balance Weave (PB) belt must be purchased if it will be run on an Audubon sprocket tooth drive. A Precision Balance Weave is the same specification as the balance weave except it's manufactured to very tight tolerances to precisely fit an Audubon Sprocket Tooth. If a balance weave belt is is being driven by a positive tooth drive, there will be premature belt and drive failure,and the belt will jump the sprockets. Precision Balance Weave mesh must be used with sprockets. Do not put a Balance Weave mesh on with a sprocket drive. This will cause belt damage. There are recommended pulley (drum) diameters for each specification. An Audubon Applications Engineer can review your application to recommend the proper drum diameter you should be using with your Balance Weave mesh. Belt wrap around the drum and temperature will factor into correct diameter for your application. If in doubt, always go as large as possible. To small of a diameter drum will cause belt failure. If a belt is being spliced into an existing mesh, it must be from the same manufacturer as the original belt, otherwise a full width sample will be required by Audubon prior to manufacturing to insure your initial belt tolerances are held and your belt splices into your existing mesh. Do not use crowned pulleys on a balance weave mesh. Click above if you require a belt recommendation. A quote will follow shortly. Click above if you know the spec you want quoted. A Quote will follow shortly.